"Along the way I've had the joy of working with some very inspiring women in my role at JBF," says James Beard Foundation President Susan Ungaro. Here are just a few of them. F&W's #FOODWINEWOMEN series spotlights top women in food and drink in collaboration with Toklas Society. Follow the hashtag on Twitter (@foodandwine). This year will be the 25th anniversary of our James Beard Awards, which are often called the Oscars of the food world. Since I joined the Foundation, it's been so exciting to see the growing number of women winning over the past several years. Watching chef Nancy Silverton receive the Outstanding Chef Award last May was so exciting, because it was the fourth time a woman has won. And seeing chef Barbara Lynch honored with the 2014 Outstanding Restaurateur Award, just one year after Maguy LeCoze was the first woman to win in the same category, was a wonderful sign that the great talent of women in our restaurant industry is being recognized in a major way. Celebrating the importance of women in all aspects of leadership in America has been a passion of mine ever since I became an editor of Family Circle. 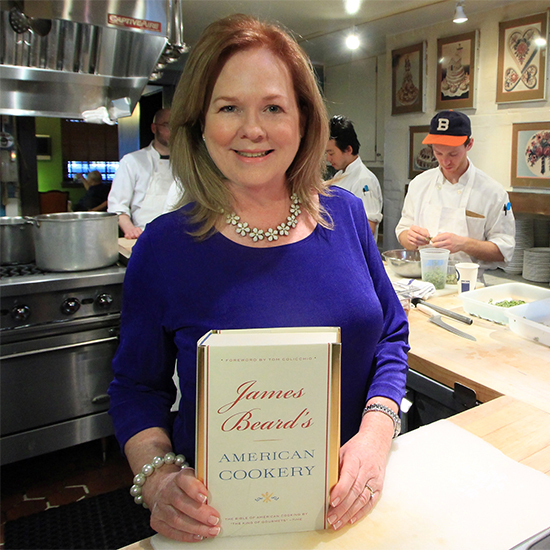 Leaving the publishing industry for the James Beard Foundation has been both an honor and an adventure. Along the way I've had the joy of working with some very inspiring women in my role at JBF. Here are just a few of them. I like to say she had the smarts to hire me as president of JBF, even though I had not worked in the food industry, when she took over as chair of our foundation's Board of Trustees. Her incredible energy and passion for celebrating the importance of a culinary education and the role of America's great chefs in making a difference is positively contagious. She never stops! Dorothy is serving as the president of the USA Pavilion at the World Expo in Milan this year and was just honored with the French Legion of Honor—félicitations, Dorothy! She became chair of the James Beard Foundation a few years ago and has been instrumental in helping our foundation highlight the important role chefs can play in helping Americans care about not only fine dining but eating right. She served as president of Women Chefs & Restaurateurs in the late 1990s and has always been a charismatic leader focused on the importance of chefs' contributions to our food world. She recently launched a #dessertworthy campaign to help all of us watch our sugar intake but also enjoy the sweet life. She has often been called the "godmother of organic food," a description that doesn't nearly do her justice. When I met Nora several years ago, I was struck by her determination to make our food world a better, healthier place. Her energy in all matters organic is thrilling to watch. She was clearly a woman way ahead of our time when through grit and determination she created the first certified organic restaurant in America. Restaurant Nora just celebrated its 30-year anniversary. Who couldn't be more inspired by her pioneer spirit! A longtime friend from the publishing world whom I have always admired. From being the first African-American model to grace the cover of a woman's magazine to opening her eponymous restaurant featuring the first Southern/soul food-inspired menu in Midtown, she has been an amazing and talented trailblazer. I've always appreciated that whenever I've asked her and her wonderful husband, Dan, to do anything for our foundation, they always say yes. She recently went public with the news that she has Alzheimer's. The Daily News wrote, "The B used to be for beautiful, now it stands for brave." I couldn't agree more. Deb is another woman who makes me smile. I first met Deb when our foundation honored her with our Leadership Award in 2011 for her work creating an "AmeriCorps-like" program focused on improving nutrition and food knowledge in our nation's schools. She comes from a family of Ohio farmers, so she knows food from the soil up. I was so delighted to hear she was just appointed as executive director of Michelle Obama's Let's Move and senior policy adviser for nutrition policy. She is a fresh voice for solving the obesity epidemic in our nation. And I love the fact that there is a female farmer in the White House!